Uh-Oh! Is there really a big hungry bear nearby? Let’s find out in the beloved story, The Little Mouse, The Red Ripe Strawberry, and THE BIG HUNGRY BEAR, by husband and wife writing duo Don and Audrey Wood. 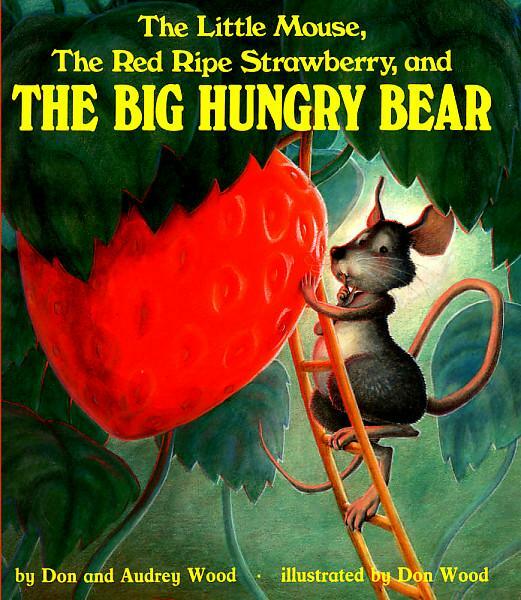 In this book, a clever mouse attempts to keep his strawberry safe from the bear by using many excellent problem solving techniques. You, as the reader, play an important character in the story. Activity: The little mouse and the big hungry bear both love strawberries. Ask your child, “What else do mice and bears like to eat?” Then, have a conversation with your child about food you both like to eat, or don’t like to eat. Use descriptive language to describe your favorite food. Parent: I love bananas! They taste and smell sweet. If I squeeze a banana in my hand, it feels squishy. I have to peel it to eat it, and the peel is my favorite color, yellow. Activity: Make up a silly song with your child about food. Activity: Take turns singing a chant about your favorite foods. The Little Mouse, The Red Ripe Strawberry, and THE BIG HUNGRY BEAR features beautiful illustrations that help tell the story. Let’s look at the cover, what do you see? What is the little mouse doing? Do you think that is a good way to keep the strawberry safe? Where would you hide the strawberry? Is there really a bear? Tip 2: Reading books helps your child build their vocabulary skills. In this story, we encounter the word, “tromp,” which may not be a familiar word. Explain to your child that the word “tromp” means to walk heavily. Invite your child to repeat the part that says, “BOOM! BOOM! BOOM!” and stomp his/her feet like a bear tromping in the forest. Activity 1: Let’s play pretend! Once you have finished the book, your child may ask you to read it again. Invite your child to participate in the story by pretending to be the mouse. If available, allow your child to have props, such as a spoon and a pair of sunglasses, to help retell the story. A pillow, or stuffed animal, can be used as a pretend strawberry. Activity 2: Make a strawberry puzzle. Invite your child to draw a picture of a strawberry, or find a picture of a strawberry in a magazine or food ad. Explain to your child that you will cut the strawberry in half with scissors to make a puzzle. If possible, let your child use the scissors to practice their fine motor skills. Show your child how you can both share the paper strawberry by each taking half. Then place it back together again to make a whole strawberry. Activity 3: In this story, the mouse and the strawberry both wear a silly disguise. Set your imagination free by playing dress-up with your child! Use old clothes, costumes, or recyclables around the house to create a unique disguise. Send a picture of you and your child wearing a disguise. Be creative! We can’t wait to see what you loved about The Little Mouse, The Red Ripe Strawberry, and THE BIG HUNGRY BEAR!